When you think about French music, what comes to mind? Romance perhaps or chanson or Alizee? They are part of the country's musical culture, but certainly not all there is to it. French jazz group Papanosh wants to introduce a different side to the world. Celebrating the 22nd Francophonie Festival, the avant-garde group was invited to China to share their riotous style of jazz to Chinese audiences for the first time. 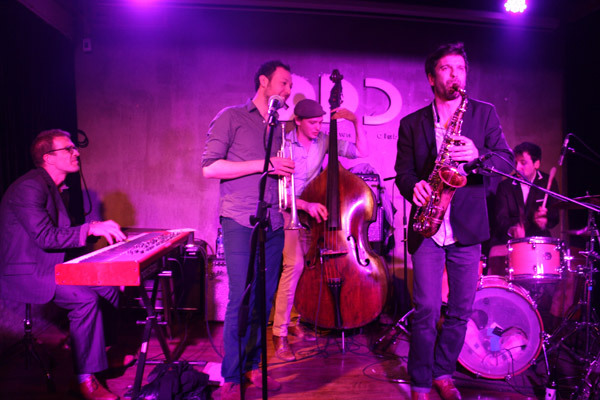 Formed 11 years ago in Rouen, a city on the River Seine in the north of France, Papanosh is a rising star on the jazz music scene. Quentin Ghoman plays the trumpet and trombone, Raphael Quenehen plays the saxophone, Sebastien Palis is responsible for the organ, piano and accordion, Thibault Cellier is the double bassist while Jeremie Piazza acts as the drummer. From their perspective, music should be filled with imagination, joy, improvised risk, tender smiles and sonic rapture. "Music is not pure, otherwise it would be boring. We like to mix traditional music together and share them with others. Our music wants to convey the idea of liberty to receivers, and it is not concerned with political meanings but to free people’s minds," Quentin Ghoman said. "Papanosh is like a house whose wide-open doors ring out with reminisces of Jewish music, contemporary forms, urban horns, birdsong…" Raphael Quenehen added. After winning the Jazz Migration 2013 (AJC) and having been selected by the expert jury for jazzahead! 2015 (Echoes of France), Papanosh has earned more and more attention in the jazz world. Jazzman Magazine described the band as: "Close to Mingus, ARFI, Uzeste, and with a more contemporary sound (their own) at the same time, ambushed by zapping and perpetual recycling, Papanosh knows how to cultivate disorder without making a system of it, they know how to stimulate our appetite for surprises but can as well move us in a simple way." Using traditional music as a springboard for their caustic and absurd sense of humor, Papanosh's musical world is a multi-faceted story with blasts of collage. In the future, Papanosh plans to explore different musical elements in their creations. "A crazy session of spiritualism full of improvised compositions, impromptu songs, and disordered rearrangements that makes us who we are."